If athletes use a few grams of Chlorella every day, their workouts may result in a greater increase in endurance than if those same athletes would not use Chlorella. A Japanese animal study, which sports scientists from Ritsumeikan University published in the American Journal of Physiology - Regulatory, Integrative and Comparative Physiology, suggests this. A second group was given Chlorella. [CH] If the rats had been adult humans, they would have used 3 grams of Chlorella daily. The researchers used material from Sun Chlorella. 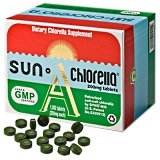 Sun Chlorella sponsored the study. The researchers trained a third group of test animals. [HIIE] Four days a week they let the rats swim with a weight attached to their tail. Each session consisted of 14 bouts of 20 seconds. Between the sets the animals rested for 10 seconds. The researchers trained a fourth group of rats, and gave them Chlorella as well. At the end of the supplementation period, the researchers had the rats make short and intensive swimming bouts until exhaustion. Supplementation with Chlorella increased the number of bouts, but training increased this number even more. However, the combination of training and supplementation produced the best results. After the test, the researchers measured the concentration of lactic acid in the rats' blood. Chlorella suppletion and training inhibited the increase of this concentration, you see above. This is probably because Chlorella supplementation and training increased the production of monocarboxylate transporter 1 and -4 [MCT1] [MCT4] in the red muscle fibers - the type 1 muscle fibers involved in endurance efforts. MCT1 and MCT4 enable cells to transport lactic acid out & into the cells. These transporters play a crucial role in the conversion of lactic acid into glucose. Both Chlorella and training also stimulated activity enzymes such as citrate synthase, cytochrome oxidase, lactate dehydrogenase and COX. These enzymes play a role in lactic acid metabolism. In addition, chlorella supplementation and training also increased the activity of the signal molecule PGC1-alpha in the muscle cells. That molecule allows cells to produce more mitochondria. Mitochondria transform nutrients into energy. "Thus, Chlorella could be a beneficial supplement for even vigorously trained athletes, as well as habitually exercising individuals, and those with metabolic disorders", the researchers summarize. "The findings of this study reveal a great potential for the utilization of Chlorella." 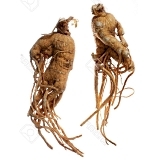 Ginseng roots contain a dozen steroid-like substances, and one of them is ginsenoside Rg1. After they have taken 2 caps with of 5 milligrams of the ginseng steroid Rg1, young inactive men's fitness levels increase. Salecan, a new sports supplement? Chinese molecular scientists do animal studies with Salecan, a beta-glucan that is made by a bacterium. Fursultiamine is a synthetic version of vitamin B1. If you give it to mice, their stamina increases spectacularly - and their muscles will get stronger.